STATE CAPITOL, PHOENIX – Last week, on a 4-4 decision, the United States Supreme Court failed to overturn a lower court decision in Dollar General Corporation v. Mississippi Band of Choctaw Indians, effectively upholding the Court of Appeals’ decision that Indian nation courts have civil jurisdiction over non-tribal members within their borders. Rep. Albert Hale, D-St. Michaels (District 7), applauded the decision but cautioned that the jurisdiction of Native American nation courts is still under attack on many fronts. 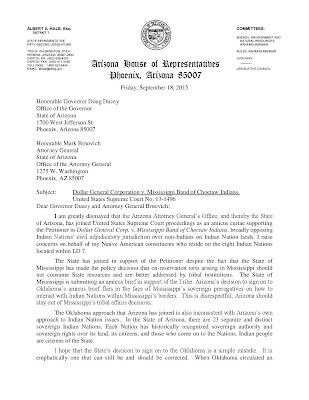 Hale explained that in this case, a tribal member, a minor, was sexually abused by a non-Indian employee of Dollar General. The abuse occurred on the Indian reservation, and the Indian nation court ruled in favor of the minor. This is a clear example of the importance of Native American courts, according to Hale. "The victim has the right to recourse in his or her own home area. And Indian nations, like all sovereign entities, have the authority to enforce their laws and maintain order within their borders. They have the power to protect everyone’s rights within their borders, and provide courts where legal action can be taken against anyone who violates the rights of others. "These attacks on Indian nation court jurisdiction will force Indian nations to more heavily regulate the influx of non-members onto their lands," Hale said. "That could create long lines at the borders and complicate efforts to provide services and promote tourism and economic development on Native American lands. 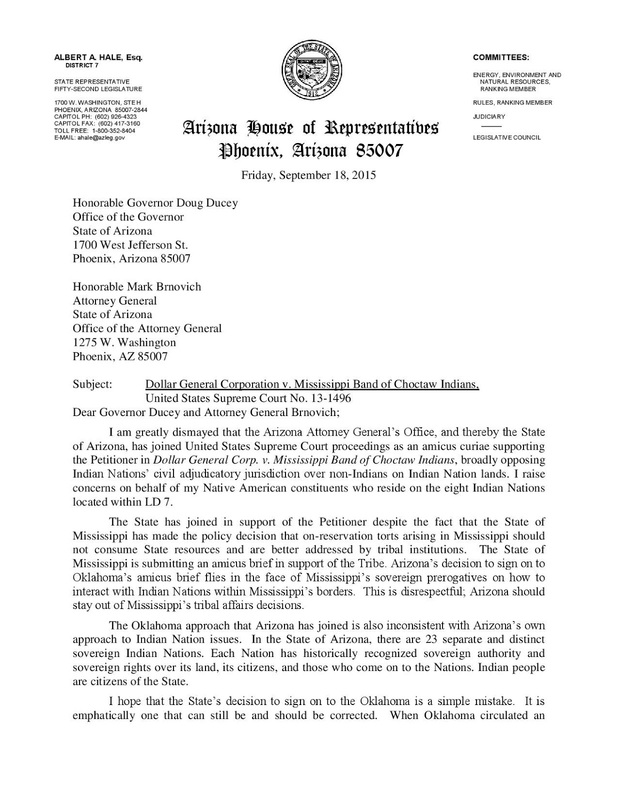 "I was appalled that Arizona Attorney General Mark Brnovich submitted an amicus brief against upholding the jurisdiction of Indian nation courts on this issue," Hale said of an action the Brnovich took last year intervening in the case, not on the side of the Indian nation and the victim, but on the side of those wishing to strip the Indian nation court of its inherent jurisdiction. 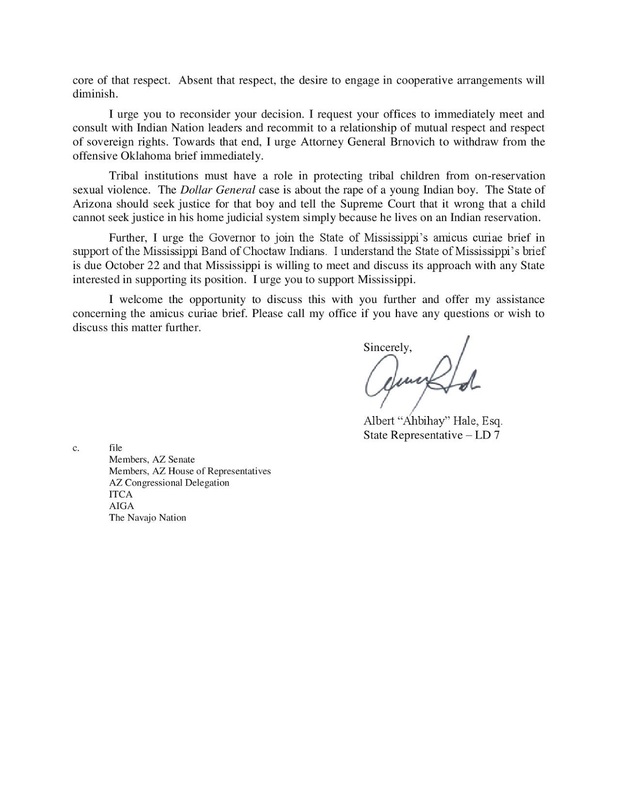 Hale sent Brnovich a letter in September 2015 urging him to withdraw the amicus brief he filed in the case. 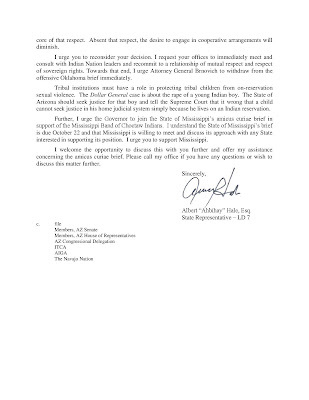 The full letter is below. "As Arizona’s attorney general, Brnovich represents all of the people who live in this state - including Native Americans. 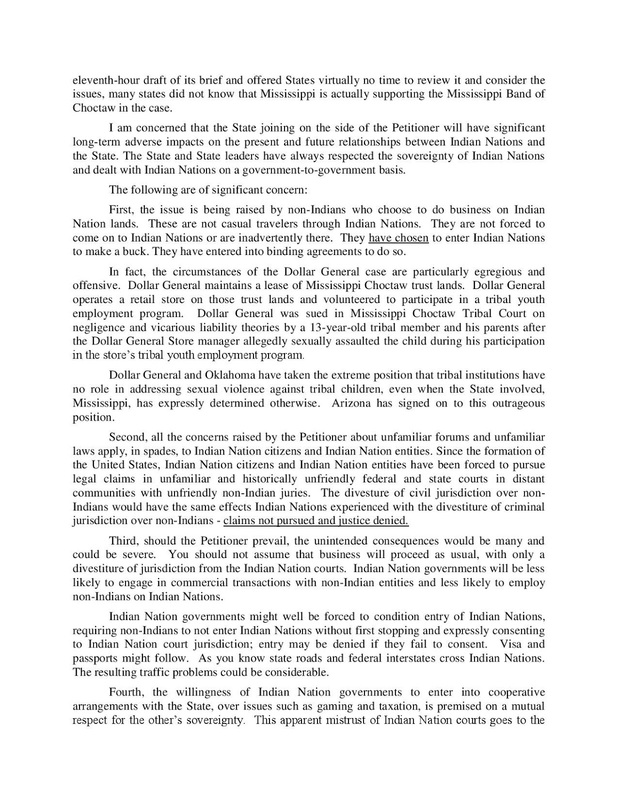 He should support victims and Indian nation court sovereignty," Hale said. 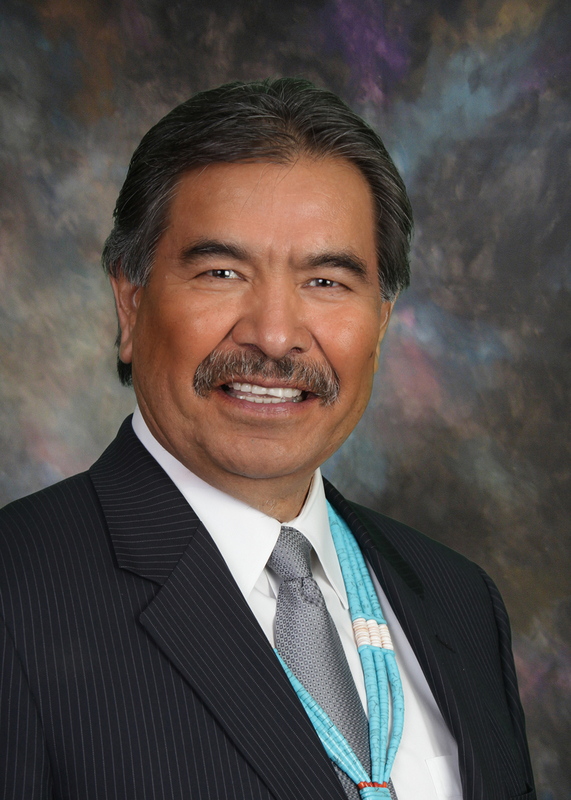 Rep. Hale is an enrolled member of the Navajo Nation. He was born in Ganado and raised in Klagetoh, Arizona. He is Ashiihi (Salt), born for Todichiini (Bitter Water). His maternal grandparents are Hanaghani (Walk About clan). His paternal grandparents are Kiyanii (Tall House clan). He is a 1969 graduate of Fort Wingate High School, a Bureau of Indian Affairs boarding school located east of Gallup, New Mexico. He holds a Bachelor of Science degree from Arizona State University, Tempe, Arizona (1973), and a Juris Doctor degree from the University of New Mexico School of Law, Albuquerque, New Mexico (1977), and an honorary Juris Doctor degree from Phoenix School of Law (2012). He is the former President of the Navajo Nation. He served four terms in the Arizona state Senate.